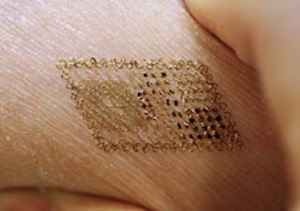 These ultrathin microelectronic 'tattoos' cling to the skin and measure electrical activity in the body; they have a bright future in medicine. To achieve flexible, stretchable electronics, Rogers employed a principle he had already used to achieve flexibility in substrates. He made the components—all composed of traditional, high-performance materials like silicon—not only incredibly thin, but also "structured into a serpentine shape" that allows them to deform without breaking. The result, says Rogers, is that "the whole system takes on this kind of spiderweb layout." Jack Vance fans might be thinking about the spray-on conductive film from his 1979 novel The Face.